A 2001 Aquinnah bylaw requiring archaeological reviews of proposed building sites has unearthed scores of significant discoveries, revealing glimpses from some 10 millennia of Wampanoag history — and virtually no sign of any other population. “Every site has been a Native American site,” said archaeologist Holly Herbster of the Public Archaeology Laboratory in Pawtucket, R.I., in a talk at the Aquinnah town hall last Wednesday. About 50 people turned out to hear what researchers have discovered since the zoning bylaw went into effect nearly two decades ago. Aquinnah is archaeologically unique, Ms. Herbster said, because the Wampanoag tribe has occupied the land continuously for about 10,000 years. Today’s tribal members are direct descendants of the Island’s first people, who held Gay Head in common until more than halfway through the 19th century. “The land was not divided until the 1860s, and many of the original property bounds are still in place,” Ms. Herbster said. Unlike other parts of the Island, plowing and similar land disruptions — the bane of archaeologists seeking undisturbed evidence — were limited in the Gay Head area, she said. And because non-native people did not begin living there until the beginning of the 20th century, the prehistorical record is exclusively Wampanoag for more than 9,000 years. Displaying a map that showed Aquinnah peppered with more than 350 archaeological sites that have been studied over the past century or so, Ms. Herbster told the audience that more than 40 of them were discovered as a result of the 2001 bylaw. Most of the sites date from before Europeans arrived on Martha’s Vineyard, she said, with the earliest signs of human occupation dating back 10,000 to 7,500 years before the present day (B.P., in archaeological terms). Shell mounds along the shores of ponds and harbors provided calcium-rich environments, preserving perishable artifacts such as bones that usually break down in the Vineyard’s acidic soils, Ms. Herbster said. Stone gouges, axes and weights for nets and fishing lines are among the oldest tools that have been found. The highest density of prehistoric sites, both in Aquinnah and Islandwide, date from what’s called the Archaic Period of 7,500 to 3,000 B.P., Ms. Herbster said. These digs have yielded artifacts such as arrowheads and the chipped stones used to sharpen them. From the Woodland Period, 3,000 to 450 B.P., archaeologists have discovered clay pottery, smaller arrowheads than the Archaic versions and evidence of maize cultivation. Trade goods, such as beads and copper items, also begin turning up during this era, she said. The advent of commercial whaling in the early 18th century brought “more interesting stuff,” she told the audience. Wampanoag men were famous harpooners, often voyaging for years on end in search of whales across the globe. This period is “when you see a lot of imported material that’s coming from all over the world,” Ms. Herbster said. The earliest Wampanoag settlements of all are likely submerged beneath the waves, because the shoreline of 12,000 to 10,000 years ago was miles from Gay Head. Core testing of the sea floor off Gay Head has revealed that it once was dry land, she went on. The precise locations of Aquinnah’s archaeological discoveries remain confidential, Ms. Herbster said, and sacred and ceremonial sites such as burial grounds are strictly hands-off. Owners and developers of the properties deemed worthy of archaeological surveys, a decision made by the town in collaboration with the Massachusetts Historic Commission, are not required to change their building plans if a Wampanoag site is found. However, archaeologists may perform what’s called data recovery — removing everything of significance — before construction begins. At times, a discovery may spur homeowners to change their plans voluntarily. One of Ms. Herbster’s favorite finds is the footprint of an early wetu, the traditional, round Wampanoag dwelling crafted of saplings and reed mats or bark. “We were able to work with the property owner, architect and engineer to relocate the (construction) impacts,” she said, adding that the homeowners later told her they liked the new configuration better. “Having the tribal history being told, and being able to see that in the ground — it’s an incredible thing,” Ms. Herbster told the audience. 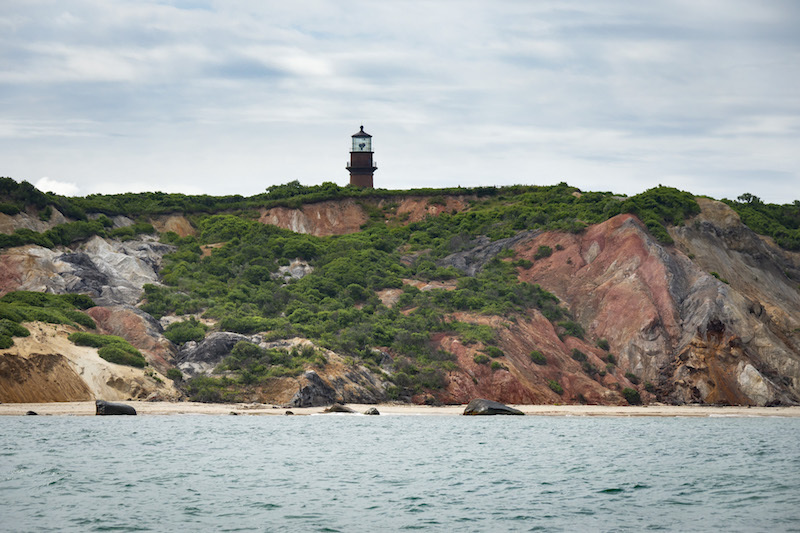 But while archaeological surveys reveal many things about Aquinnah, its people and their history, other questions — such as how many Wampanoag lived there in prehistoric times — may never be answered. Very fascinating information. Are they publishing this report online? Amazing! What an incredible story in the land. Incredible finds. I am happy to hear that doing an archaological dig before construction, especially on an island that was inhabited for thousands of years, is commendable. Just goes to show that the indigenous people lived on that island/land for thousands of years and in just a few hundred years people have managed to build, build, build and continue to do so because.....they can. Preserve the history when you can. Gutting your Captain's Houses with a 'facade' in the front certainly isn't preserving history in the name of 'open concept'. Buying up of historic Inns, changing the flavor of the island and fast change will forever lose the beauty and historic nature of Martha's Vineyard. Once it's gone, it's forever.